The Intestinal Inflammation Tissue Bank (IITB) is a repository of human samples used in biomedical research initiated by Dr Paul Beck at the University of Calgary. The bank stores and has the ability to collect intestinal biopsies, blood, urine and stool from patients with inflammatory conditions as well as healthy ones which are used by researchers in approved studies. 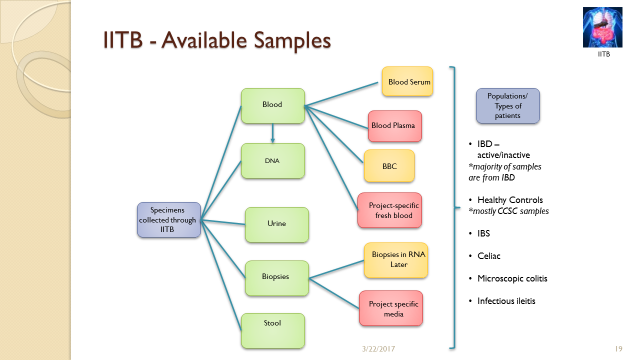 The Gastrointestinal Database (Committee Chair: Dr. Gil Kaplan) is an electronic repository of patients’ phenotypic data (and control subject) as well as genetic and environmental data. The cause of many inflammatory conditions of the intestine are still unknown. Our group is studying how inflammation and injury occur in the Gastrointestinal (GI) tract to produce diseases such as Celiac disease, irritable bowel syndrome, ulcerative colitis, Crohn disease and cancers. The bank has supported over 70 studies and over 25 CIHR as well as other national and provincial level grants, contributed to over 80 publications in major journals and has been responsible for securing $68,308,216.00 in external grant funding to date. The IITB has become a critical part of clinical, translational, and basic science research in the field of gastroenterology at the University of Calgary. We aim to foster collaborations and create an efficient research program between clinicians and laboratory scientists to study various intestinal disorders. Long range benefits of these types of studies include improved screening and diagnosis, prevention, cure, and better treatment options for intestinal conditions. Our Biobank is a multi-user resource that is available to a wide range of researchers in Alberta and elsewhere. To access the bank and /or data from the database, a completed access proposal must be submitted to the IITB Research Liaison who will then send it for review to the Tissue Bank Committee (TBC) and the Database Committee. Following approval by committee and the Conjoint Health Research Ethics Board (CHREB), collection and distribution of samples for the project can commence. The samples are provided in an anonymous fashion where only information on the age, gender, diagnosis and current medications of patients are revealed. The IITB consists of clinicans, researchers and clinician scientists from adult and pediatric gastroenterology and surgery. A full list can be found through the link on the sidebar. Our patient participants support research by providing consent for the use of their donated blood, stool tissue samples as well as access to their health records. Thanks to the participants who understand and support research, more than 95% of patients we contact choose to enroll in our program. Further information about the IITB for participants is found in the information pamphlet. We recruit patients through the UCMG GI Clinic and FMC Endoscopy unit.